Ian Talbot has been in the snow business for so long, even Santa Claus sends him a Christmas card! Since pioneering ski tourism and launching Powderhound Magazine in the mid-1970s, Ian now runs a successful media consultancy and public relations business, Skipress, servicing the ski, snow and summer resort businesses in Victoria’s High Country. With regular trips by road and between the major resorts such as Falls Creek Alpine Resort and Mount Beauty, Ian cannot afford to be waylaid by inclement weather or unreliable transport and is delighted with his choice of vehicle; his second Honda CRV. Both regular and occasional visitors to Falls Creek turn their head when Ian’s distinctively liveried Honda passes by. 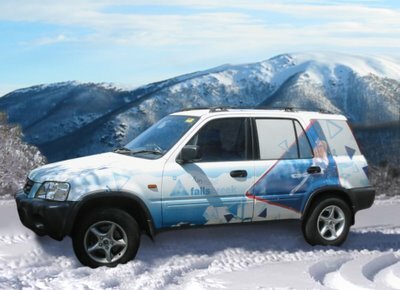 Looking something like a cross between a mobile blizzard and a giant polar mint, the CRV is decorated with an unmistakeable ski and snow theme. “I wanted something that really said what I was all about,“ says Ian, the edges of his mouth curling slightly to suppress a huge grin,” the design took two full days to apply and is made up of a series of very big stickers. And Ian sure gets about! Although most of the mileage is clocked up around town, Ian is quite comfortable extending the CRV’s normal operating environment – especially after his mighty winter adventure. Normally the twisty 100km trip would take about two hours, but the heavy snowfalls had left 30cm of snow over most of the road and in some places, Ian found drifts right up over the bonnet. Even though he was more than happy with the CRV’s off-road ability and All-Wheel-Drive stability, Ian found this demonstration very convincing. “I really like the look of the new CRV,” he says wistfully, “knowing full well another snowflake paint job is just around the corner!